I really loved this calendar. I just wish I could have kept it hanging up with company over, without any questions being asked. I actually received my Eden's 2012 Community Calendar for Christmas in 2011. I was a little taken aback. One, I was not expecting it and two, I could not believe how nice it was. Your calendar will be shipped to you in a box without any packaging around the calendar itself. I was really happy I received this for Christmas. It was just in time for the new year and I did not have a calendar yet. When you open up the calendar and begin flipping through it you will see a neat picture for each month with a famous quote, and it tells you by whom it was said. All the pictures are kind of a mix of things, there is no particular theme. The front cover of this has pictures around the border surrounding the words 2012 Eden's Community Calendar and Eden Fantasys. The spine to this calendar is spiral bound. If you flip the calendar over, the back states "This calendar represents the culmination of a labor of love undertaken by the Eden photographers club and Eden Fantasys on behalf of the Eden Fantasys community. Within are photos not by professionals in photo shoots, but rather wonderful, real photos taken by wonderful, real people. Each month represents something that characterizes our community and shows where, why, and how we live. It is the breadth of diversity of this inclusive community that makes it a collective special place to share our hopes, aspirations, angst, and desires. It is our hope that this calendar will provide those of you who are a part of the community and those of you who are considering joining us to see what makes us... us." I would have to say that this calendar is not discreet, due to Eden Fantasys being listed on every month, unless the person seeing it does not know what Eden is. This was one of the nicest calendars I have ever had. It was so pleasant to look at every month. Reviewed by HoneyBear69 (Eden Advanced reviewer) Hey. FREE!!! 2012 EdenFantasys Community Calendar! 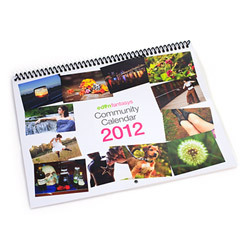 Thank you for viewing 2012 EdenFantasys Community Calendar review page!